William of Mass Destruction: Izzy's Winter Motto. Gotta get the sun while you can. Izzy, you are so right. Izzy, you are a cute opportunist! Oh yea, and it feels sooooooo good! All the sun all the time while you can! You are wise oh languorous one! So wise! I know the feeling! 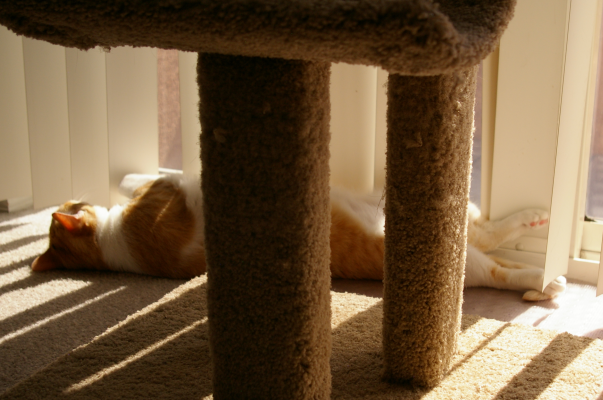 Sun puddles are going to be few and far between this week - and then I have a cat show this weekend, so won't be getting many sun puddles then either. You are sure right! Soak up them there rays! You have sun puddles to lay in, all cloudy here today.